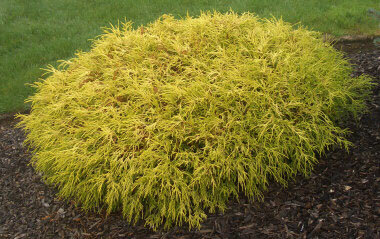 Golden Thread Cypress provides bright yellow thread-like foliage throughout the year. There are several forms of this plant. and all offer truly a handsome accent. Easy to grow in a rich, moist soil. Does best with protection from the hottest afternoon sun and the worst of winter winds. However, ample sunshine is needed to bring out the best golden coloration. Matures to a 60" x 60" weeping layered mound. From 5 gallon pots.